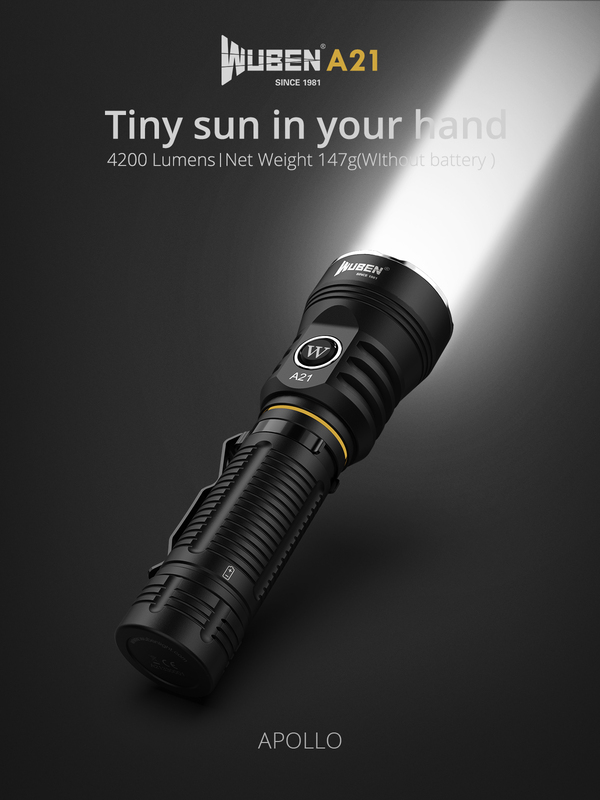 Buy Wuben A21 Max 4200 Lumens Cree XHP70 LED Rechargeable LED Flashlight 21700 Li-ion Battery , from for $149.99 only in Website. Worldwide Fast Free Shipping! 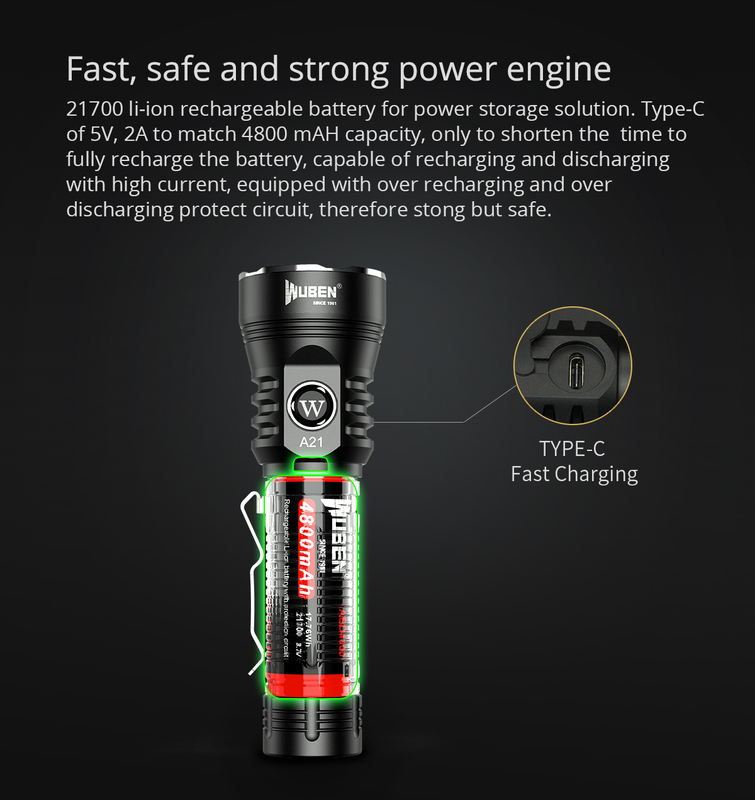 Built in Type-C charging port, 5V2A fast charging. 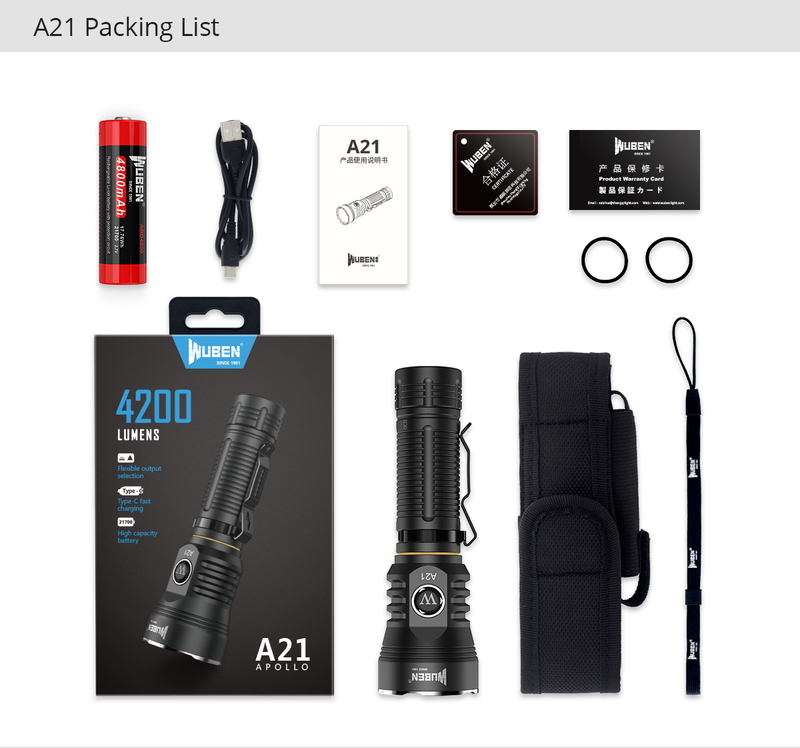 A21 is a powerful flashlight applied to outdoor and camp lighting. 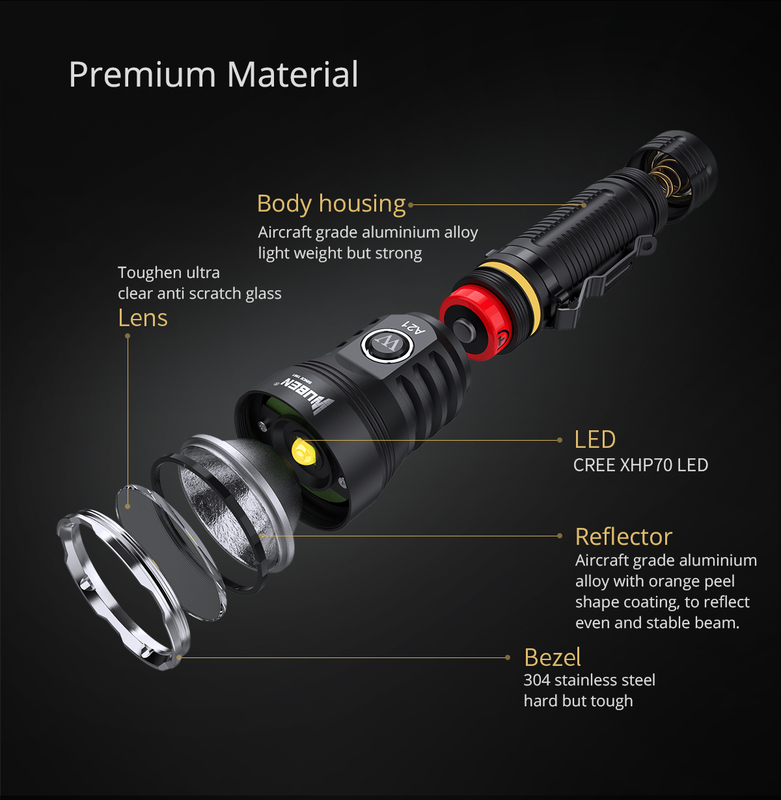 Equipped With 1*XHP70 CREE LED, the Max output is up to 4200 Lumens. 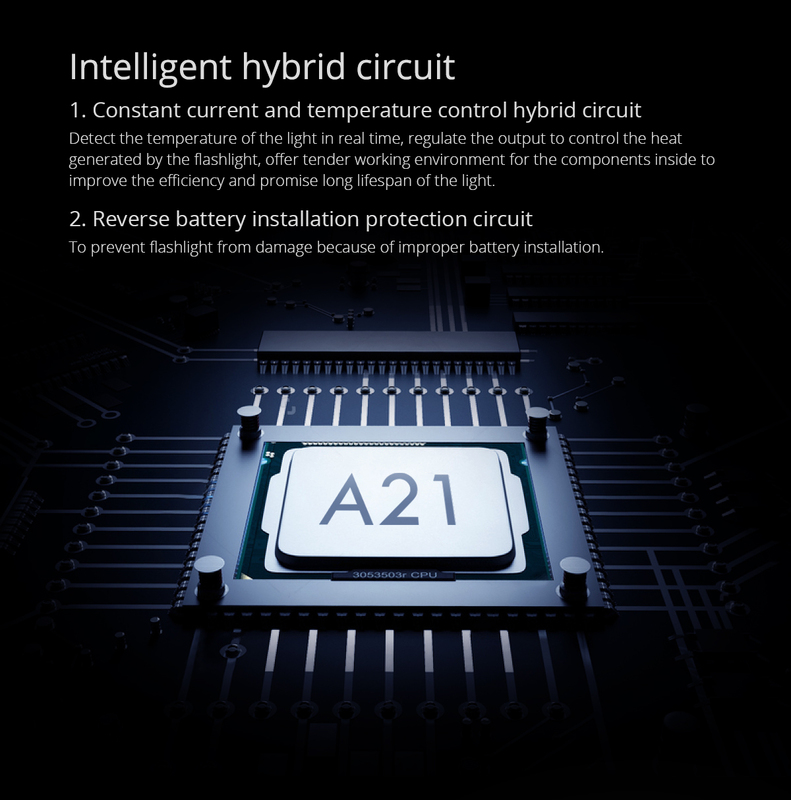 The power supply is designed with 1*21700 battery and built-in Type-C charge,which is more convenient to use. 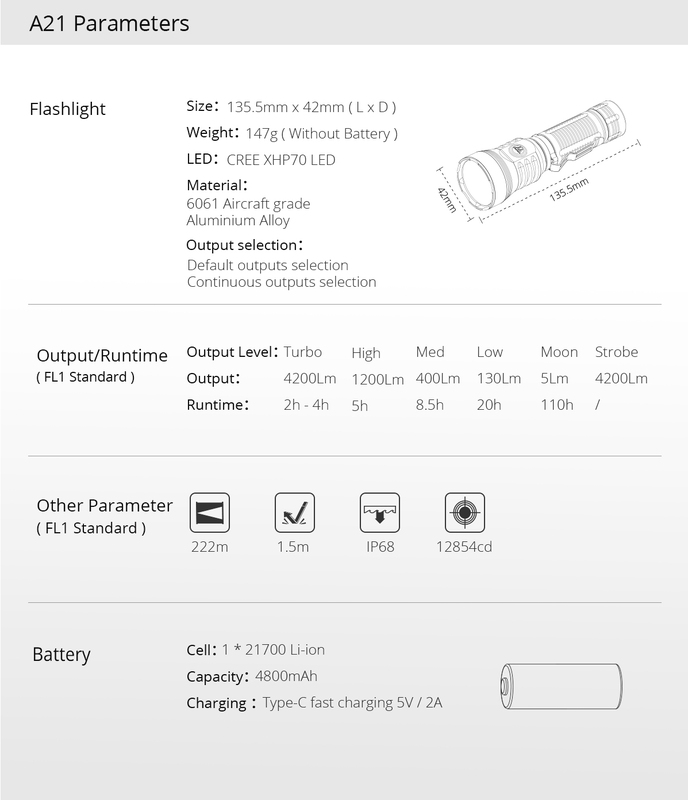 Utilizes CREE XHP70 LED emitter with 100,000 hours lifespan. 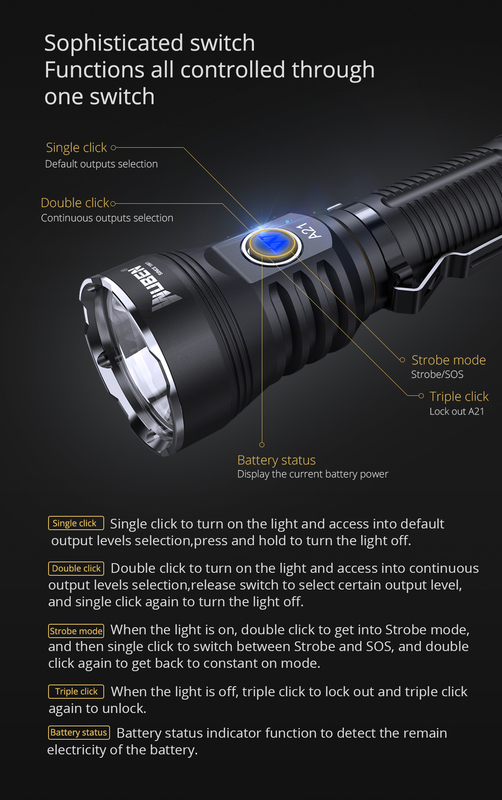 Powered by 1*21700 battery. 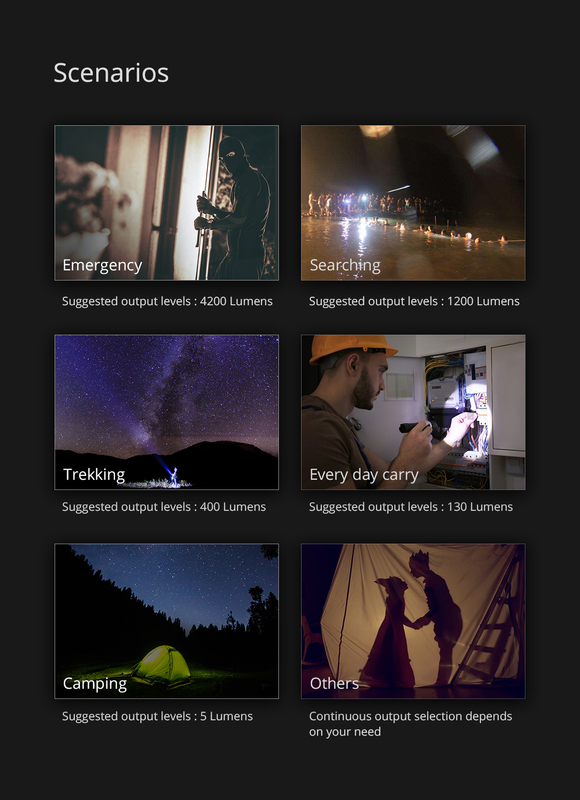 Max output is up to 4200 lumens. Max beam distance is up to 222 meters. Max run time is up to 110 hours. High strength aerospace aluminum body.Aluminum alloy vacuum electroplating reflective cup. 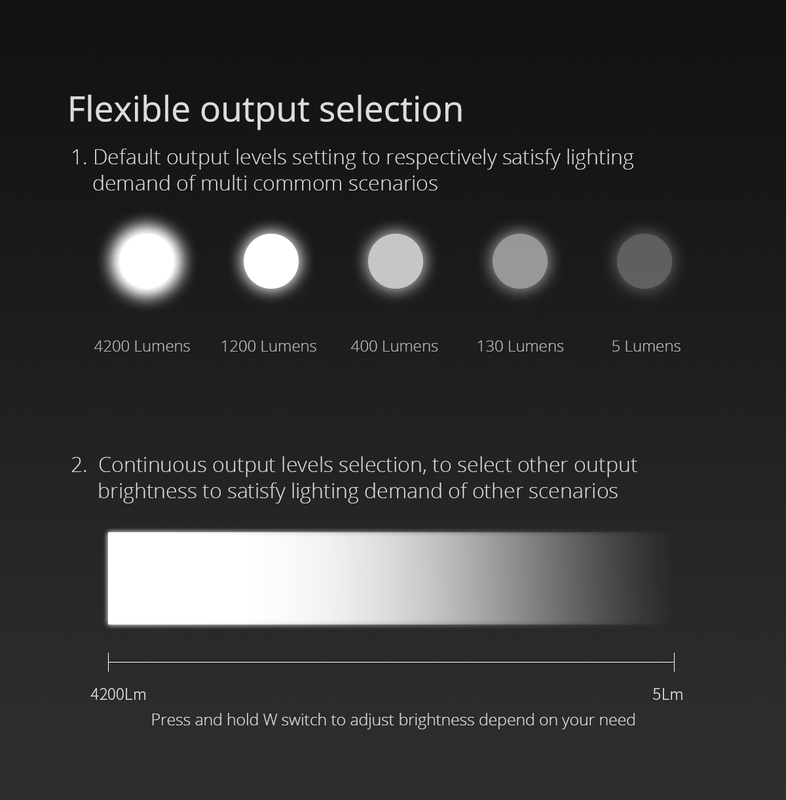 Double - side coated anti-scratch optical lens with up to 99% transmittance. Intelligent low power warning. Reverse polarity protection. 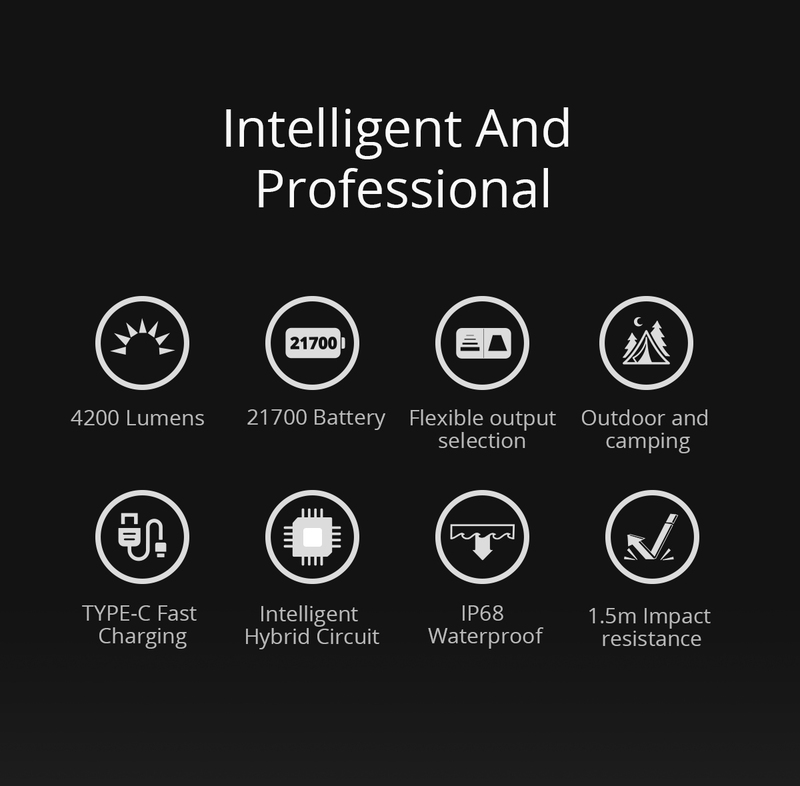 Intelligent temperature control design, digitally regulated output maintains constant brightness. 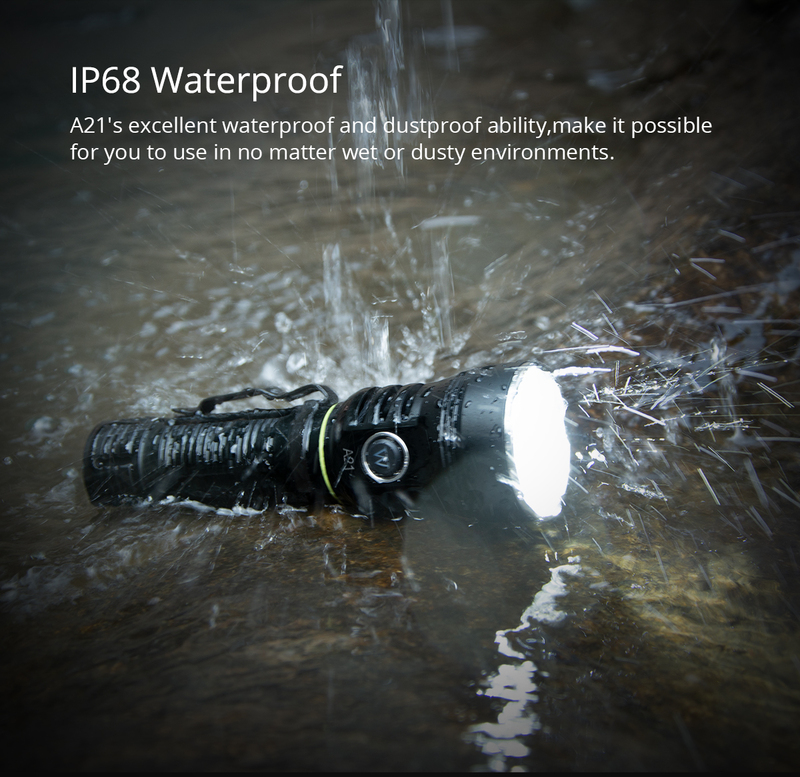 Waterproof level IP68 ( 2m underwater 1 hour ) . Impact resistance 1.5 meter. Tail stand upside down function.